Mostly cloudy and becoming windy with thunderstorms likely in the afternoon. A few storms may be severe. High 87F. Winds SSW at 20 to 30 mph. Chance of rain 100%..
Clearing skies after some evening rain. Low 56F. W winds at 10 to 20 mph, decreasing to 5 to 10 mph. Chance of rain 90%. Sebring’s Nathan VanDam (13) attempts to block a pass attempt by Labelle’s Evan Williams (2) durinbg Monday night’s soccer match at Firemen’s Field. The Cowboys beat the Blue Streaks by a score of 4-1. Sebring goalie Julian Jara prepares to block a shot by Labelle’s Jose Esquivel during Monday night’s match. SEBRING – Though the Sebring Blue Streaks continue to show improvement, they still have some work to do as indicated on Monday night in a 4-1 loss to the Labelle Cowboys at Firemen’s Field. Sebring played Labelle evenly for the first twenty minutes, limiting the Cowboys to just a couple of shots on goal. It was at the 20-minute mark of the half that Labelle was able to take the lead with a 40-yard shot from the left side of the field that got past the Sebring goalkeeper, who was playing up to put the Cowboys on top by a score of 1-0. Sebring had opportunities to tie the game before the half, the first with 9:30 left, when a shot by Vinay Krishnadas was blocked by the Labelle goalkeeper. Five minutes later, Kevin Rodriguez just missed a 30-yard free kick that careened off the right upper corner of the goal post back onto the field to keep the Blue Streaks scoreless going into the half and still trailing 1-0. It did not take as long for the Cowboys to expand their lead in the second half as Neitali Padilla scored on a 20-yard shot at the 12-minute mark to give Labelle a 2-0 lead. 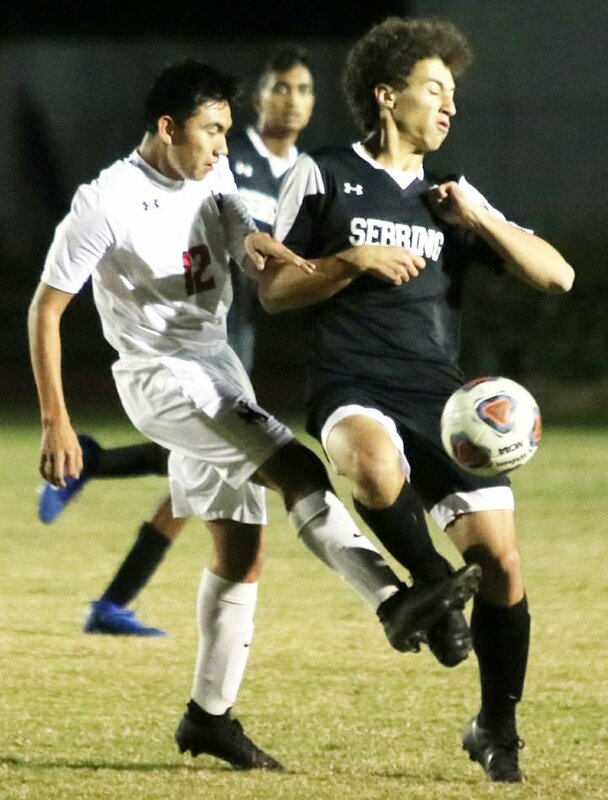 The Cowboys made the score 3-0 with 19 minutes left in the game when Luis Orduna-Casiano weaved through several Sebring players with the ball and drove a 25-yard laser that was nearly saved by Sebring goalie Julian Jara. Instead, the ball lifted just high enough to glance off of Jara’s hand into the goal, extending Labelle’s lead to 3-0. 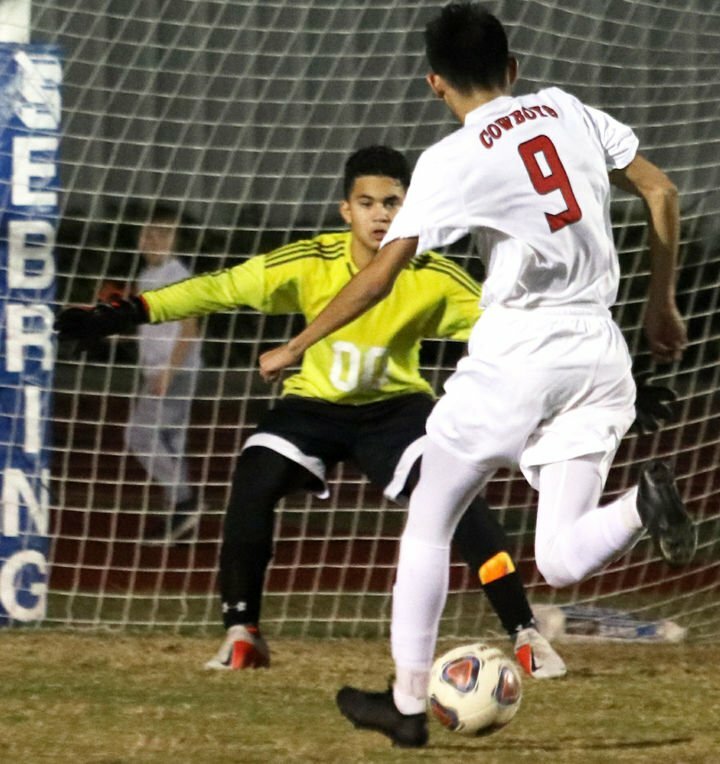 With ten minutes left to play, Jara made another great save when he was able to extend his foot to his left to block a shot by Labelle’s Jose Esquivel. Esquivel scored a minute later on a breakaway up the middle to increase Labelle’s lead to 4-0. Sebring was able to avoid the shutout with eight minutes left in the game. Allen Areceo crossed the ball from the left side of the field to the right side of the Labelle goal, where Emerson Petit Val was able to head the ball in the goal from a few yards out to make the final score 4-1. Sebring is scheduled to play Friday night at Firemen’s Field against the DeSoto Bulldogs in a non-district match-up.